Blue And White And Mad All Over: 'Chinamania' NPR's Susan Stamberg delves into the history of Victorian England's fascination with "blue and white" -- collectible Chinese porcelain, showcased in a new exhibition at the Freer Gallery in Washington, D.C. This Qing Dynasty porcelain incense burner dates back to the late 17th century. You know those little blue-and-white bowls some Chinese restaurants use for serving hot-and-sour soup -- clanky, cheap little things? The objects on display at the Smithsonian Institution's Freer Gallery of Art, on the Mall in Washington, D.C., are nothing like that. Yes, they're blue and white, and yes, they were made in China. But the Freer's objects are pieces of old porcelain, some made in the 17th century. In 1860s London, painter James McNeill Whistler started collecting this kind of porcelain; many other Victorians did as well, leading to a British craze one writer called "Chinamania." Freer curator Lee Glazer says the British bought the blue-and-white bowls, dishes and plates so feverishly that cartoonists of the day saw Chinamania as a disease, creeping into nurseries, living rooms, kitchens. But the porcelain they snapped up was actually not all that precious. It was mass-produced for export. "[The Chinese] kept the best for themselves. Of course they did," says Glazer. "Who wouldn't?" 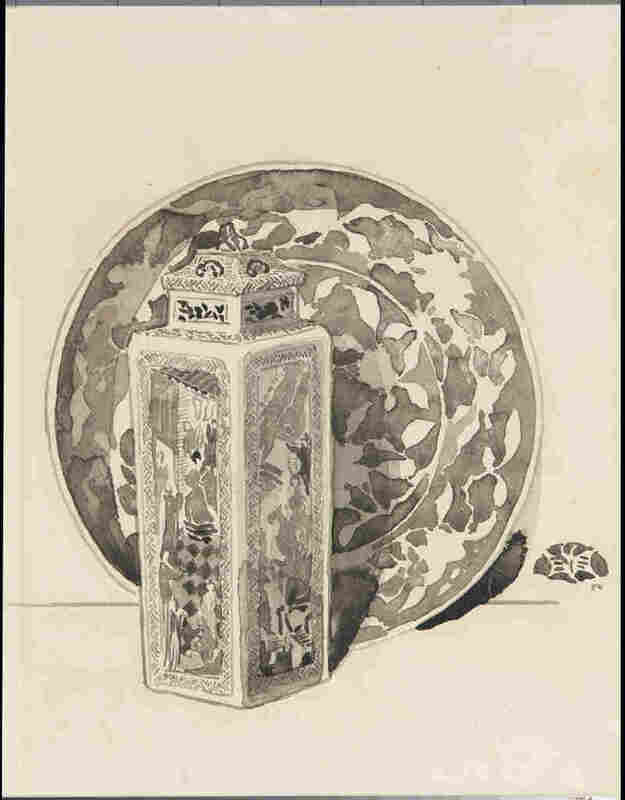 James McNeill Whistler did this ink and watercolor illustration of a Chinese porcelain canister and saucer dish. Still, the blue-and-white exports were a huge hit in the marketplace. The never-before-seen items were viewed as foreign and exotic by British Victorians. Whistler had some 300 pieces in his collection, along with a Chinese robe, which he wore for a portrait in which he was surrounded by sober black-clad fellow artists. Chinamania has an actual historical and sociological significance. It was one of the first instances in which an emerging middle class with a disposable income could buy things because they desired them -- not because they needed them. Glazer says it marked the beginning of consumer culture. 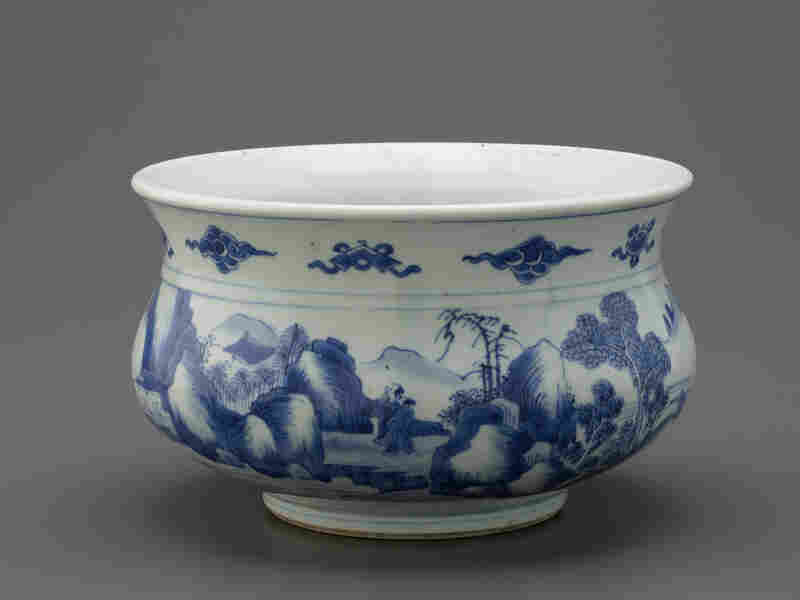 The people snatching up the blue-and-white china in Victorian England were making new money from 19th century revolutions in industry such as transportation, mass communication and the expansion of global trade. Meanwhile, the Freer Gallery's gift shop is selling new and old blue-and-white pieces, including an antique urinal. The squat rectangular pitcher has a handle and very large spout, and it would look great on a side table -- for those who can spare $400.